Having worked with five non-profits and charities thus far in my early career, I have started to notice that there is a specific type of voice adding tremendous value to the philanthropic dialogue – the unique voice of youth engagement. The truth is, fundraisers in functional roles within charitable organizations cannot do what they do without other voices reaching the donor. I believe that youth ambassadors and youth engagement are critical to the success of charities being effective storytellers and getting their message out there to the broader community. In my experience working on a number of youth leadership programs run by charities and non-profits, I have met so many youth who are eager to contribute to the organization’s cause and to help raise funds and awareness. I have also had the remarkable opportunity to watch youth from diverse communities or backgrounds step forward to elevate a cause and share their story. I asked two inspiring youth that I know from my own blind and partially sighted community to share what diversity and inclusion mean to them personally, and how they are contributing to the non-profit and charitable sector. 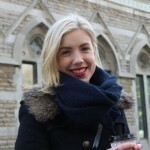 PhD student at the University of Toronto studying disability, feminist and performance studies. Jessica, who is legally blind, advocates for accessibility and inclusion within the theatre and arts sectors and is actively making change in her community by engaging decision-makers and young leaders alike. As I watch young leaders like Jessica and Kathleen share their experiences with accessibility and inclusion – the philanthropic case for support and the impact we’re all working towards feels real. While fundraisers will meet with donors to speak about the value of investing in the next generation’s well being – these youth are actively living that value proposition every day in the work that they do. When youth are engaged with non-profit and charitable causes, sharing their stories, and actually influencing change through programs and services – there is so much potential to elevate diversity and inclusion for people from diverse communities. I feel so incredibly lucky to be inspired every day by the work that these young leaders are doing – and as someone working in the non-profit and charitable sector, I will do everything in my power to ensure that youth always have a voice. 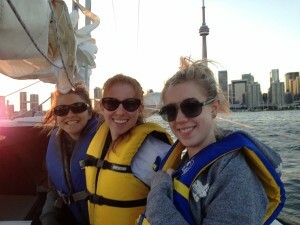 Photo – from left: Jessica Watkin, Kathleen Forestell, and Amy Soden at Blind Sailing Association of Canada’s Youth Sails program.